Antrim County is known for its rural landscape and access to the Chain O’ Lakes throughout the county. It is unique in the six-county Grand Vision region for its many quality parks, some of which include Barnes Park, Elk Rapids Day Park, Palmer Park, along with many others that are great community assets for the many villages and townships that make up Antrim County. Great work is being done throughout Antrim County that is forwarding principles of the Grand Vision in Antrim County, such as the formation of a DDA in Elk Rapids which are strengthening Antrim’s unique villages and townships. If you would like to become involved in efforts that forward Grand Vision principles in Antrim County contact any of the Active Grand Vision County Collaborators listed below. Benzie County is known for its natural scenic landscape with more than 50 inland lakes, two natural rivers and thousands of acres of national park. A strong agricultural economic sector makes Benzie County unique in the six-county Grand Vision region. Benzie has tremendous communities that have been busy for the last couple of years doing great work inspired by the Grand Vision principles - places like the City of Frankfort and the Village of Honor, among others. Benzie County also benefits from the existence of a Grand Vision County Team for networking and communications that forward Grand Vision principles within the county. If you would like to become involved in the Benzie County Team, or any of the Active Grand Vision County Collaborators, you can find their contact information listed below. Join their Google Group to stay up-to-date on the Benzie County Team meetings you can also contact the Benzie County convener Shauna Fite at shauna@mlui.org, or 231-941-6584 ext. 25. Grand Traverse County is known as the regional commercial and institutional hub for northwest lower Michigan in places like Traverse City, Garfield, East Bay and Acme. While being the most populated county in the six-county Grand Vision region, Grand Traverse is also home to Northwestern Michigan College and Munson Hospital and is an area of significant fruit and crop production. Grand Traverse is unique for its central location where many regional organizations forwarding the Grand Vision principles are located. All regional Grand Vision Network Teams hold their meetings in Grand Traverse County due to its central location. If you would like to become involved in efforts that forward The Grand Vision principles in Grand Traverse County contact any of the Active Grand Vision County Collaborators listed below. To connect with regional efforts for the six Grand Vision counties connect with any of our regional partners, which can be found on The Grand Vision Partners page under C.O.R.E. Group Members. 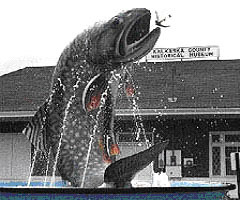 Kalkaska County is known for its abundance of inland lakes, streams, rivers, and numerous state and county parks which can get you close to the natural beauty that surrounds you in Kalkaska. Kalkaska is unique in the six-county region for its sports complex, “The Kaliseum”, and recreation events like the Iceman Cometh Challenge Bicycle Race, which draws national competitors to the region each fall. Many of the efforts to forward The Grand Vision principles are focused out of the Village of Kalkaska, a central hub of Kalkaska County, with work such as adding blanket wireless internet service within the Village of Kalkaska business district. If you would like to become involved in efforts that forward Grand Vision principles in Kalkaska County contact any of the Active Grand Vision County Collaborators listed below. 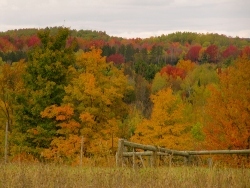 Leelanau County is known for its accessibility to Lake Michigan and scenic farmland. Leelanau is surrounded on three sides by Lake Michigan, a unique feature within the six-county Grand Vision region. Leelanau is a destination for beaches in the region, including Empire Beach, Sleeping Bear Dunes National Lakeshore, and Suttons Bay Municipal Park and Beach, among others. Leelanau has many communities forwarding Grand Vision principles in their own unique communities, including the Village of Empire with village Wi-Fi access covering the M22 corridor, Front Street & Empire Beach and Suttons Bay with plans for increased beachfront access and walkability. If you would like to become involved in efforts that forward Grand Vision principles in Leelanau County, contact any of the Active Grand Vision County Collaborators listed below. Wexford County is known for its strong industrial sector, award-winning golf, and large variety of outdoor activities. Wexford is unique in the six-county region for its strong mix of industrial business and variety of recreational opportunities which make it a destination business development as well as tourism. Much of the efforts forwarding the Grand Vision principles in Wexford County are focused out of the City of Cadillac. For example, Wexford County has worked hard to develop a county-wide regional economic development consortium to assist in job creation and retention in Wexford County. Collaboration, like the development of this consortium, epitomizes the essence of the original Grand Vision study: moving county development forward collaboratively and with a common vision. If you would like to become involved in efforts that forward Grand Vision principles in Wexford County contact any of the Active Grand Vision County Collaborators listed below.